This weekend we will take a little break from our education activities to sing our program "In time of..." here in San Francisco at the Conservatory of Music. At the Saturday (8pm) performance, something unusual will happen. 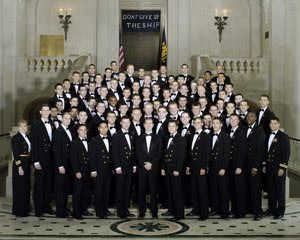 71 members of the United States Naval Academy Men's Glee Club will attend the performance and then sing something with us! They're on tour in California at the moment and asked if they could come along, and we said YES! There are a few tickets for that performance left. We will repeat "In time of.." on Sunday at 5pm - without the navy - they will have set sail by that time.